Today, we will review the interrogative (question) form of sentences in Simple Future Tense. If you need more help on this, please go back to Lesson 42. 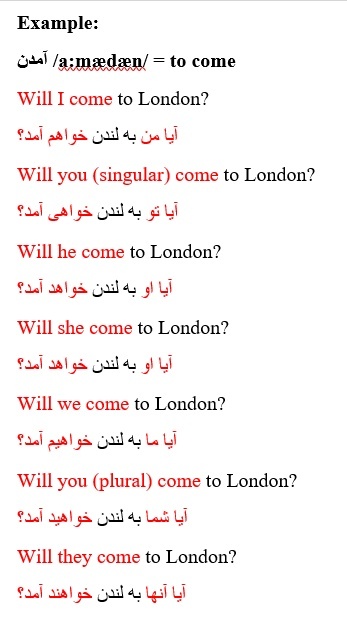 I will use the same ten verbs we have so far used in the past few weeks. Please follow the examples and finish the job. Enjoy! Will I go to Brazil? Will you (singular) go to Brazil? Will he go to Brazil? Will she go to Brazil? Will we go to Brazil? Will you (plural) go to Brazil? Will they go to Brazil? Will you (singular) eat lunch? 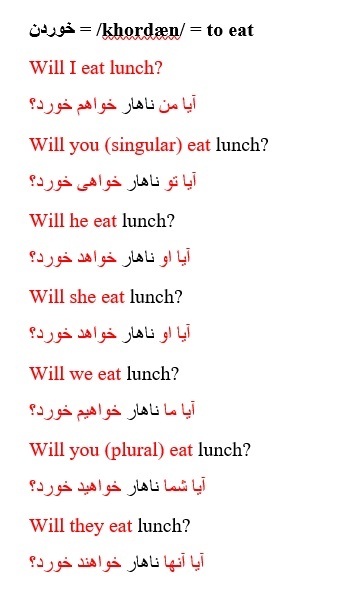 Will you (plural) eat lunch? Will I listen to the radio? 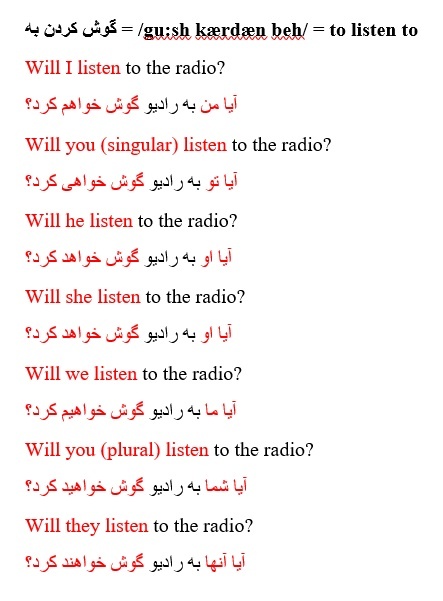 Will you (singular) listen to the radio? Will he listen to the radio? Will she listen to the radio? Will we listen to the radio? Will you (plural) listen to the radio? Will they listen to the radio? Will I see your friend? Will you (singular) see your friend? Will he see your friend? Will she see your friend? Will we see your friend? 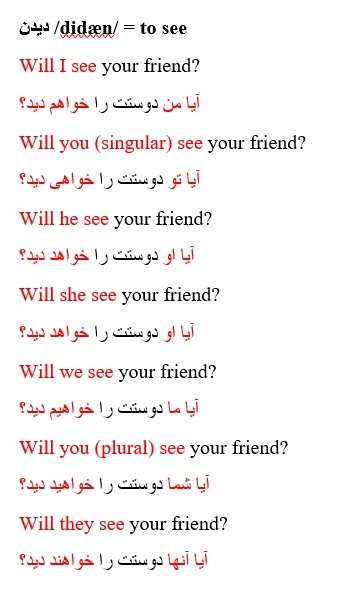 Will you (plural) see your friend? Will they see your friend? Will I read a book? Will you (singular) read a book? Will he read a book? Will she read a book? Will we read a book? 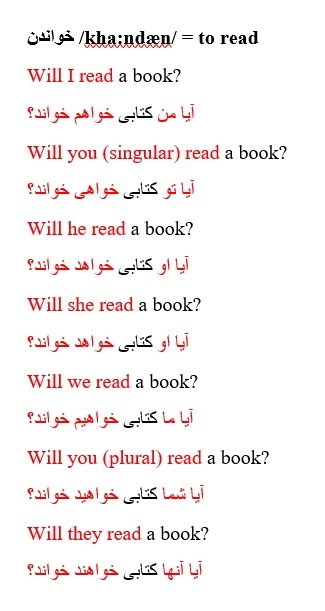 Will you (plural) read a book? Will they read a book? Will I write a letter? Will you (singular) write a letter? Will he write a letter? Will she write a letter? Will we write a letter? 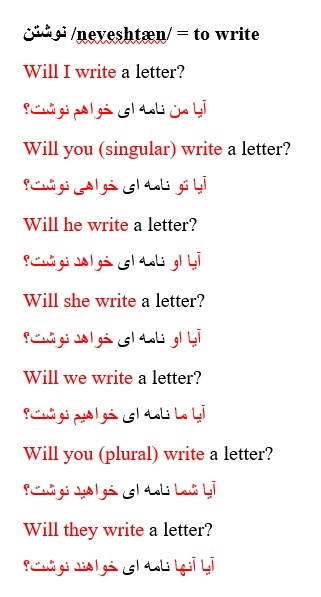 Will you (plural) write a letter? Will they write a letter? Will I clean my car? Will you (singular) clean my car? Will he clean my car? Will she clean my car? Will we clean my car? 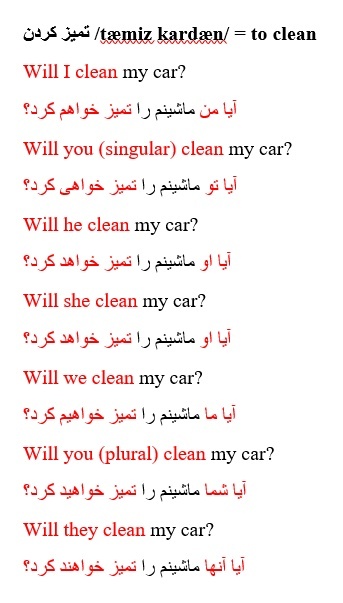 Will you (plural) clean my car? Will they clean my car? Will you (singular) sell my house? Will he sell my house? Will she sell my house? Will we sell my house? 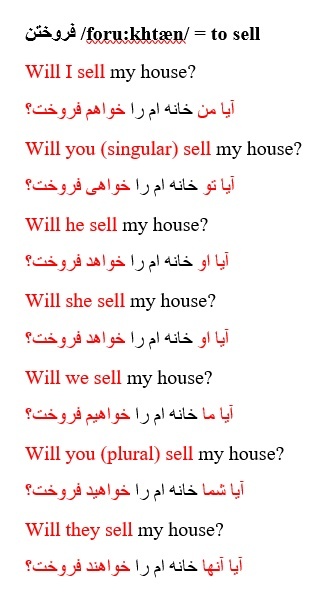 Will you (plural) sell my house? Will they sell my house? Will I wash the dishes? Will you (singular) wash the dishes? Will he wash the dishes? Will she wash the dishes? Will we wash the dishes? 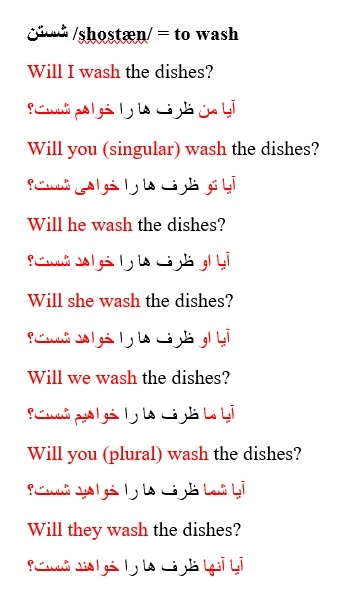 Will you (plural) wash the dishes? Will they wash the dishes? Will I buy a car? Will you (singular) buy a car? Will he buy a car? Will we buy a car? 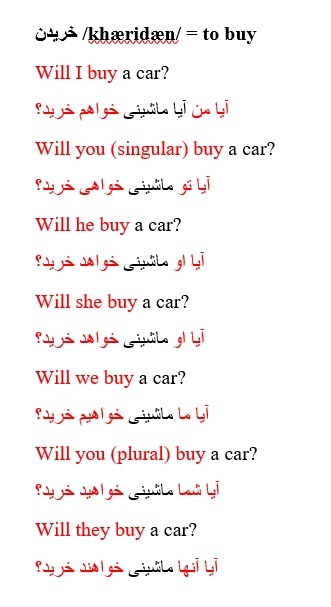 Will you (plural) buy a car? Will they buy a car?